Blood-soaked nightmares. Of another time. Of another place. Of another life. 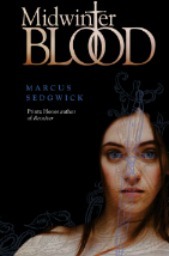 The unusual story of Midwinterblood by Marcus Sedgwick begins in the future, in the year 2073. A young journalist named Eric arrives on a remote island, where it is rumored that the people live forever. He is immediately drawn to a woman named Merle, but soon begins to notice that the locals are behaving strangely…very strangely. Little does he know that his story is but one chapter in a piercingly poignant, savage saga that stretches across time and transcends the boundaries of life and death. I love fiction that is unsettling, particularly when it comes to the YA genre. Eric and Merle’s story has elements of the shrieking madness of the film The Wicker Man, including a distinct undercurrent of unease and disturbing pagan rituals. To tell you too much about the seven interconnected stories would be to give away too many of their delicious secrets. But following the opening segment, the plot moves backwards in time, and by the third story “The Airman,” the pieces start fitting together. My favorite ones are “The Painter”(1902), “The Unquiet Grave” (1848), and “The Vampire” (10th Century), many of which are violent, pensive, and sad. One of the things I like best about the plot is how Eric and Merle are bound together throughout the centuries, and yet their relationship is never the same. Sometimes they are lovers, sometimes they are children, etc., but there is always a connective emotional thread between them. The prose is descriptive and powerful, with fragments of rough beauty jutting out from the horror contained in the intricate framework of the story. Behind them grew a tree, an odd tree, with a straight trunk, and a pointed crown of brilliant green leaves. Gold objects hung in the glossy leaves, and Bridget was startled as she saw they were skulls. Shining golden skulls. Although I read a great many books for sheer entertainment value, it’s coming across an author like Marcus Sedgwick that reminds me how very formulaic many YA books tend to be. When I read his chilling gothic mystery White Crow last year, it freaked me out–I couldn’t believe the intensity of the emotional pitch, or how the persuasively suggestive writing played tricks with my perception. Midwinterblood solidified the author’s place on my list of favorite writers, and I will be seeking out every title of his that I can get my hands on. I wish we saw more YA with this degree of depth and complexity. If you’re the type of reader who prefers goth over gore, mood over mayhem, or disquiet over digust, this is exactly the kind of horror story that will appeal to you–one that is odd and beautifully strange, and one written with passion, but also with great restraint. Unapologetically bold, horrifying, and desperately doomed, Midwinterblood is not a book any reader could easily forget. We’re very pleased to be kicking off the official Midwinterblood Blog Tour next Monday, February 5th! Stop by for our Q & A with Marcus Sedgwick, when you may also enter to win a copy of this spectacular book. This book sounds fantastic. And I’ve just begun hearing of its glory. I think we definitely need more horror titles circulating the blogosphere. I feel like they get brushed aside, or maybe just aren’t promoted enough. I’ll be adding this one to my TBR, like, now. More YA horror would be awesome, Jen–particularly if it’s the more subtle, sophisticated kind like Midwinterblood. I do think they don’t get as much attention, or maybe publishers think they’re too much for teen readers. I’m just glad publishers like Macmillan (and Little, Brown, who did I Hunt Killers) take chances on material like this. I’m glad you’re going to give this one a chance! This sounds so so creepy! Love how there’s a blending of all sorts of genres and that it’s part horror! It is creepy! In the very best of ways. :) And thank you. Honestly, had it not been for your review, I would NOT have picked this book up! But now I want to read it ASAP! great review Wendy! Yay! Then my job is done, hah. Hope you enjoy it, Kailia. I feel grabby hands – this one is on my wish list. I was thrilled to see that you posted a review! Wendy, I adore this review! I think you’ve captured perfectly why I love this book. It’s the goth over gore…it had that haunting quality of beauty that I love oh so much that always captures me so much more completely than outright horror. I loved how Sedgwick did something so different in his formatting and how well it worked to make us think about the nature of love and relationships. Fantastic! Aw, thanks Heidi! I am looking forward to your review, too–he’s such an interesting writer. I’m so pleased he has such a treasure trove of back titles to dive into; just about all of them are highly praised by friends. Nice review! I have not heard of this book, but thank you for bringing it to my attention. Lovely review Wendy! Thanks for introducing me to another good book! I will definitely be adding it to my to-read list. Thank you! I hope you enjoy it when you get around to it, Maree. Ah, I’m glad it’s on your radar now, Sara. :) Halloween time is perfect for this type of book. Okay, Wendy, you had me when you rec’d it for fans of Monstrous Beauty, but the fact that it’s gothic horror makes it all the more alluring. It sounds like the kind of story that I’ll have to wait until I’m in the mood, but I feel like I will definitely love it once I get to it…or will find myself utterly creeped out, but either result is okay with me. :) Thanks for calling my attention to this book…this is the first I’ve even heard of it! Oh Jen! I think you’d like this one. Agreed, definitely a book you want to wait to be in the right mood for, but such a wonderful experience for the right reader. I hope you enjoy! Beautiful review, Wendy. I love that you bring books I wouldn’t otherwise find to my attention. I think–I think–you might like this one, Keertana. I hope you pick it up sometime just to see if you like the author’s writing. I have a feeling he might hook you. I don’t know… maybe… I have a problem with the cover.But thank you I didn’t know this one! Why did I think this was high fantasy? The title, maybe.. I do enjoy dark books and this one sounds very original and intriguing! I saw this one a while back and it certainly has caught my eye. Yours is the first review I’ve read and the word Gothic immediately captured my attention and made sure I was utterly enthralled for you review. This book is definitely the type of book I want to read and I am always searching for. I like mood and disquiet just as much as gore, but the atmosphere of a more Gothic novel is exciting. Especially one that’s set so far in the future and explores lots of different eras. I definitely like the sound of the complexity of this one. Livvy–White Crow is more traditionally gothic than Midwinterblood, but I think as a fan of that genre (as I am), you’ll find this quite compelling, too. And it does have some gothic elements to it. It IS so exciting to have a book like this on the marketplace. I hope you enjoy this just as much as I did. I had started this and put it aside, but am going to be getting back to it very soon. I was enjoying it so far. I was instantly intrigued so I think I will enjoy it. I just had to get to some tour books first. Awesome review!! Thanks Amy! I can’t wait to see what you think of it. It’s such an unusual book, and not for everybody. But so, so rewarding if you like this kind of horror and this kind of writing! I think that a lot of horror authors, especially those geared more towards a YA audience, go for the obvious scare factor. It’s nice to hear that Sedgwick uses a more subtle approach. Building the mood and creating a slow crescendo is always more effective for me. I also really like the idea of having several interconnected stories— using pieces to reveal the whole. Genius! Great review, Wendy! Exactly–there’s nothing wrong with the other kind of horror, and I occasionally enjoy it myself. But this kind of horror is much more powerful, at least to me–and it’s nice to find a YA author who does that. You’re absolutely right that there is a mood and a slow crescendo–and the pieces revealing a whole. Love your insight from reading just the review! Wow This sounds really really good. I love the little clip you included and it showcased the beauty in the darkness you were describing perfectly. I am definitely a fan of actually being scared, over simply having gore shoved in my face (though a little gore never killed any one) It’s always really nice to come across a GOOD horror movie nowadays because it seems that now they are more about grossing you out than scaring you. I haven’t read anything by this author but you have me wantin to pick up some of his work as soon as possible! Fabulous review, Wendy! Well, I don’t mind a little gore now and again either. ;) But sometimes people go into these things expecting one kind of horror and I just think it’s better when they know right up front this isn’t that type of book! But it’s just as haunting in its own way. You knew exactly what to say there to get my attention. ;) This sounds brilliant! I’ve heard of this book (and its author) before, but for some reason or another, I overlooked both. I’ll have to rectify that soon and get my hands on a copy of this. I also really liked the tone of Monstrous Beauty, so you have me utterly convinced now. Brilliant review, Wendy! You’re over there in the UK with access to all his books, Sam! I hope you get ahold of one soon. I think book MB and this book are hard to recommend to people, but I think their audiences overlap. :) Let me know if I’m right, hah. I’ve seen this one around Goodreads but didn’t give it much thought because it didn’t sound like my type of book. I didn’t even know it was YA. Eric and Merle’s connection sounds disturbingly fascinating, and I love books that easily stay with you after reading them. You made it sound creepy, in a way that is delightfully intriguing. I love the way you do your reviews, how could anyone not pick it up after reading this? I’ll have to check out White Crow as well. Thanks for messaging me back on Goodreads, I appreciate it! It’s a tricky book to recommend, because I think you either respond very strongly to and love the author’s style…or you don’t, hah. But if the review intrigues you, this one might be worth giving a shot sometime. YES, that! I really notice that when I read a very different and extremely well written book. I may enjoy some of those others but it’s books like this that stick with me. There are actually some publishing houses that I have started to avoid more because it feels like all their books are of the same formula. Thanks for the heads up on this one, I hadn’t heard of it before. Yeah, you don’t come across books like this one too often. Tor/Macmillan really does a great job of publishing books that are pretty daring–the two YA books I referenced above are actually from the same company. I read this a couple weeks ago and was totally blown away by it. After reading (and being horrified by) White Crow, I knew that I needed to read everything by Sedgwick. Now that I’ve read Midwinterblood, he’s my new favorite author. The very last story, where everything was put together and explained – it just blew my mind. My review will be up sometime in the next few days. We were both horrified by the same two books! I have to come check out your review for this when it’s up, Bekka–I only know a handful of bloggers I talk to who have read it yet. But everyone should give his books a try, IMO. Mind-blowing for sure. This sounds really creepy but I personally LOVE horror stories! This one sounds like an unforgettable read :) Looking forward to reading this! I love creepy books, too! Especially ones like this, that are more subtle and raise the hair on the back of your neck, rather than hammering you in the face, if you know what I mean. I haven’t heard of this one at all! It certainly does sound very dark and atmospheric. And from the books you reference I can tell exactly what the tone of this book is. Looking forward to the author interview next week, Wendy! I had never heard of this author until I randomly came across a copy of WHITE CROW last year, Lucy–I am thrilled he has so many titles to enjoy, all of which seem to have excellent reviews. “Atmospheric” is a great way to describe the two novels I’ve read. This seems really interesting :) I love books with darker themes so I will be sure to try this out! As always, wonderful review! Ahh, this one is definitely dark, Lottie. Darrrrrk. :) Hope you enjoy it!